Well said! Today I'm featuring the "Red Rocks" style by Keep It Simple Socks. I want to highlight not only the vast selection of designs the Ohio-based brand offers, but also the amazing landmarks that this particular style so artistically depicts; the Red Rocks of Arizona & Colorado. About the socks: I always look forward to seeing how socks are packaged and presented to the end user. I was certainly not disappointed when I received my pair of socks delicately wrapped in tissue paper with a branded sticker closure. I also enjoyed the embroidered logo detail on the outside of both socks, pictured below. 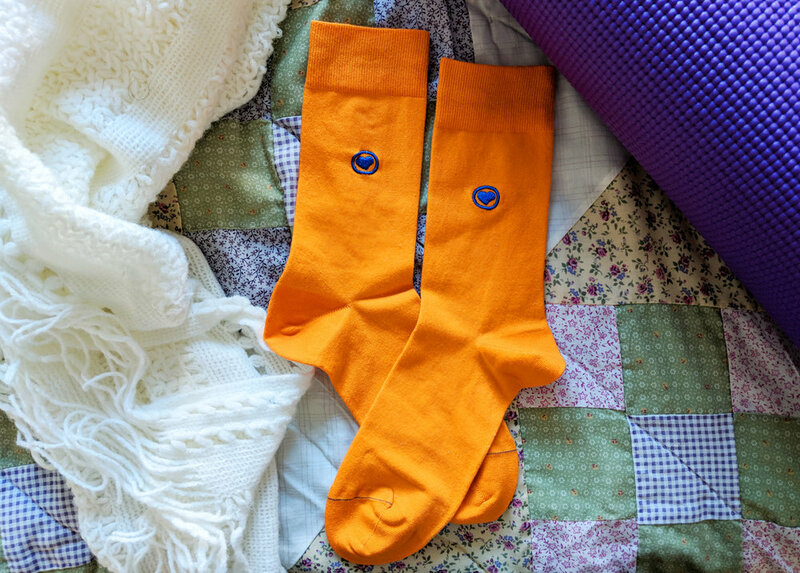 It's one thing to buy a pair of socks and forget where you bought them or what brand they are, but an embroidered logo is one way of ensuring your customers won't forget. This attention to detail really helps me to identify with the brand. Continuing on my exploration of the new socks, I tried them on. Immediately, I could tell there was additional cushion on the foot, and the welt (or cuff) was just the right tension that it did not slip down my leg, nor was it too tight. The design is really what caught my eye, as it reminded me of all the natural landmarks I've visited out West. Keep It Simple Socks offers everything from patterns to solids and seem to be unisex sizing, fitting US shoe sizes 7-13. You can read about the founders, Michael, Austen and Paul, on their website; I always enjoy learning about the people behind the brand and how it came to be. About the rocks: Having lived in Colorado for a few years myself, who could resist falling in love with the natural landscape - including and especially the Red Rock formations - *notably, in Colorado, the Red Rocks Park and Ampitheatre. In case you want to experience a concert there (and I highly recommend that you do) check out the link to the venue. Red Rocks are comprised of a red sandstone, and although I won't go all "geologist" on you, feel free to learn more about this beautiful natural wonder on your own internet adventure. Here's my video of the "unveiling" of the pair - enjoy!